Note: there are two versions of this page. This one was scanned from prints, the other was scanned from negatives. You can judge which is "better." I feel that the images from negatives are more "accurate." 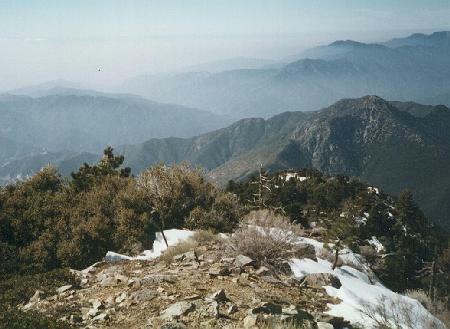 According to John Robinson, author of Trails of the Angeles, "8007 foot Iron Mountain is by far the least accessible peak in the San Gabriels. ... No trails approach its isolated summit, and to climb it you must start miles away and thousands of feet below." The hike, the most strenuous in the book, is fifteen miles climbing (and losing) 6000 feet. 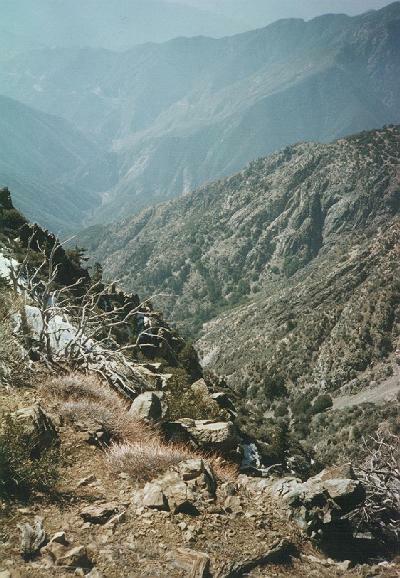 The challenge inherent in that entry in the trail book fascinated me, as did the mountain's placement -- the highest point in the front range, with the best view of the LA basin. During the years I lived in Los Angeles, I attempted the climb twice (maybe three times, I am not sure). The first time was very hot and dry. I saw a couple of rattlesnakes lounging directly on the trail. Observing their departure, I realized that those long diagonal marks in the dirt I was seeing every few yards were rattlesnake "footprints." I ran out of water less than one third of the way up, and was so exhausted that I hardly cared. I turned off and visited Allison Mine, a fascinating destination in itself. I vowed to pick cooler weather next time. Unfortunately, when I got a couple miles in it started to rain. Then came thunder, lightning, and hail. I got to the same junction, and again decided to head for Allison Mine. This time I stayed in one of the old mine shacks. Getting back, which involved several crossings of the rain-swollen San Gabriel River, was one of the most harrowing experiences I have ever had. Now, almost twenty years later, I had a business trip which would give me one free day in the Los Angeles area. Although there were lots of interesting things I could do, even lots of interesting hikes I wanted to do, I just had to finish this first. I could not let Iron Mountain defeat me. 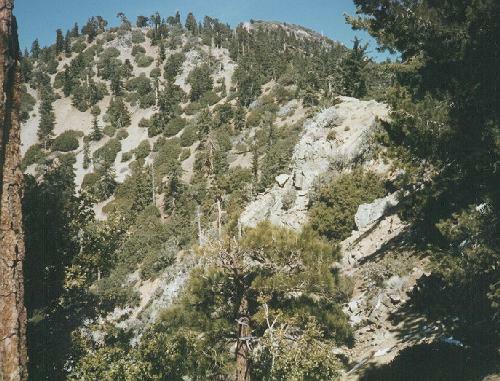 The trail up Iron Mountain starts adjacent to the East Fork of the San Gabriel, climbs about 1000 feet to a ridge, and then follows the ridge all the way to the summit. 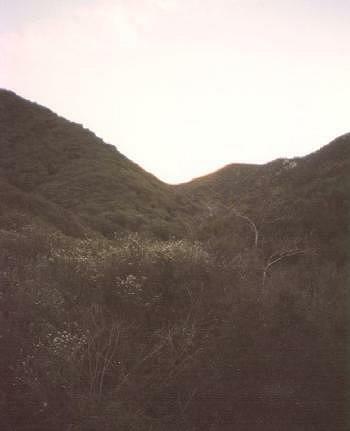 This is the view of the ridge from below, in the canyon of the San Gabriel, before the sun rose over it. Since my rule of thumb, based on mileage and elevation gain, suggested a trip of 15 hours, I was determined to start early. I had to leave my hotel downtown at 4:00 AM to escape the road closures due to the LA marathon, being run on the same day. I arrived at the trail head just as it was getting light enough to see where I was going. As soon as I got to the ridge, I could see the rest of the route. It was hard from the bottom to know if this was the top, or only a bump on the ridge hiding the real peak behind. I believe the highest point on this picture is almost the peak, but not quite. 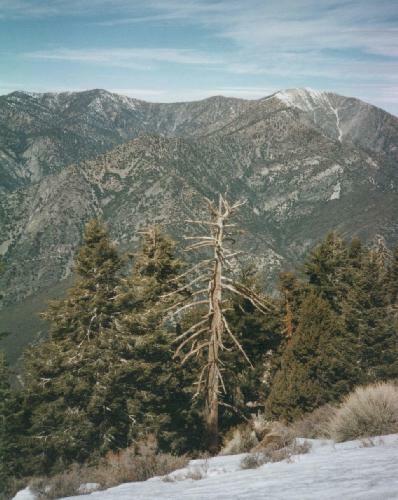 At the lower elevations, the vegetation was brushy, as shown in the first photo. Spiny yucca plants were abundant in the middle elevations, between 3000 and 5000 feet. Chaparral dominates from 4000 and 6000 feet, and then the vegetation gives way to sparse forest. You can see most of this variety here, which also shows the trail along the ridge. The chaparral apparently tortured Robinson when he climbed this peak, but I found that hikers had established enough of a path that I rarely had to fight my way through brush. this was a pleasant surprise, and permitted me to keep up a rapid pace the whole way. 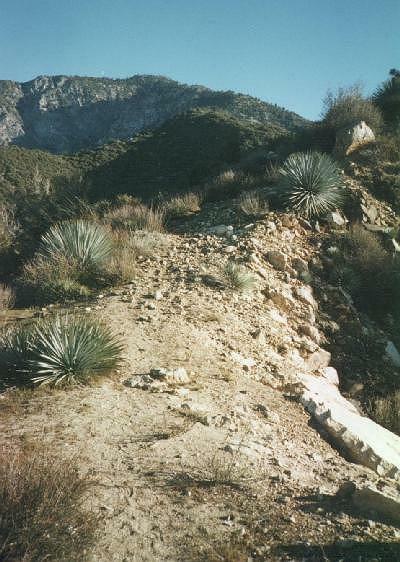 Allison Gulch, a major side canyon to the San Gabriel on the slopes of Iron Mountain, is home to the Allison Mine. On my previous trips to the area I have carried camping equipment, planning to stay overnight at the mine after climbing the peak. The mine was fascinating (the last time I visited) and well worth a trip for its own sake, but the effort of hauling my backpack up the steep trail made it too tiring for me so this time I planned the hike as a day trip and bypassed the mine. The transition from brush to forest was welcome, although the trail did not get notably less steep. This shows the ridge in the upper elevations. The high point on the left is probably the peak that can be seen from the lower elevations, whereas the peak in the center, considerably farther back and higher, is the true peak. 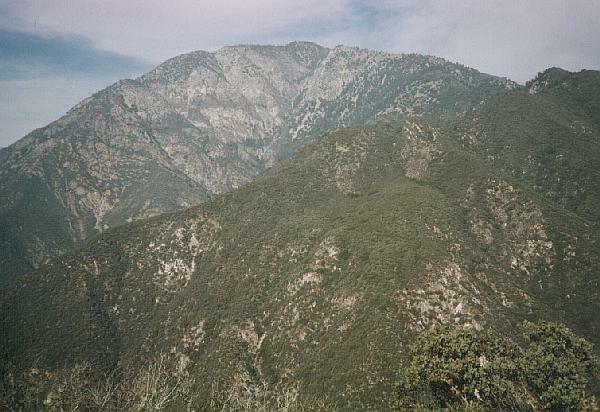 The San Gabriels consist of a "front range" directly facing the Los Angeles basin, with peaks like Mt. Wilson and Iron Mountain, ranging from 5000 to 8000 feet. Farther back, in a second tier, are the highest peaks like Mt. Baden-Powell (shown here) and Mt. Baldy (next). Both these peaks are higher than Iron Mountain, considerably easier to reach on foot, and among the most popular hiking destinations in the area. Mt. Baden-Powell is only four miles from the trailhead, Mt. Baldy three and a half from the restaurant at the top of the ski lift. Furthermore, the view of the basin and the coast from either of these mountains is obstructed by the mountains of the front range. The view from Iron Mountain, unobscured by mountains, superb in theory, still depends on air conditions. The day I climbed, there was a hazy cloud cover over the city, so I could not see much. This view shows the ridge I ascended, and the foothills beyond. LA is out there in the haze somewhere. I was surprised when I arrived at the peak. Based on my predictions, I thought I had another hour to go when I arrived at the top. The ascent took me only five hours. I was not even that tired. I attribute this to being well hydrated all the way, carrying almost no equipment other than water and a camera, and to wearing hybrid trail-running shoes instead of my hiking boots. I brought four quarts of water, eight pounds. Determined to avoid dehydration, I drank freely until it was gone (about halfway back). Even so, it was not near enough. As soon as I got back, I immediately drank two more quarts, and was thirsty still. This view of the Eastern San Gabriel foothills shows a peak, rising above the clouds in the distance. Jason at CSU Fullerton tells me it is Saddleback Mountain (Santiago Peak), in the Santa Ana Mountains, 40 miles away. .
Mt Baldy, also known as Mt. 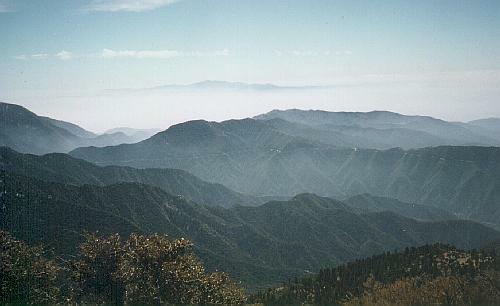 San Antonio, is the highest peak in the San Gabriel Range. Like Mt. Baden-Powell, it sits back behind foothills, and does not command a view of the LA Basin. This view shows Mt. Baldy with the peak of Iron Mountain in the foreground. 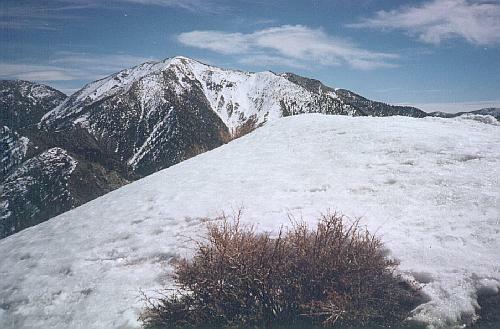 It appears that it would be possible to descend along the ridge to the left, and continue on to Mt Baldy. This would be an interesting hike for "next time." Descending from the peak was harder than I expected. The "trail" was exceptionally steep in many places. In many places I slid back on the loose rock, and had to grab onto rocks or bushes to scramble up. It proved to be much harder on my legs going down than going up, although less work aerobically. Even though I was in a hurry to get back, my time to get back was barely faster than the time to ascend. 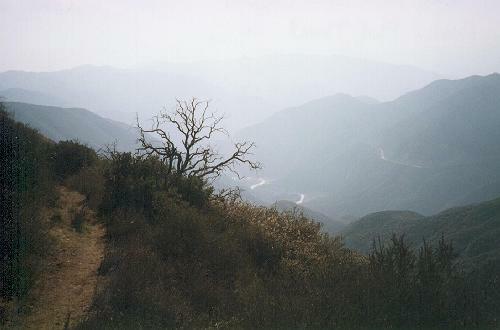 This view, of the San Gabriel River, was taken just after leaving the ridge crest. The sun, getting low in the sky, shines off the river far below. The road, visible on the right, has an interesting history. It was apparently intended as a major artery crossing the San Gabriels. Upstream several miles there is an impressive concrete bridge spanning the river, and a tunnel through the hillside. Apparently a flood washed out part of the road before it was completed, because it does not even make it to the bridge. Although I did not get the great views that are sometimes possible from Iron Mountain, I achieved my long-time goal more easily than I expected. I saw fresh footprints, but did not see any other hikers on the trail all day. When I checked the peak register, I saw to my surprise and delight, that the last person to sign the register, three weeks earlier, was someone I knew, from Fair Haven ! A student at Caltech, he is apparently using his weekends to climb in the nearby mountains, just as I did. He tells me that when he was there, the air was sparkling clear, and he could see half of Southern California.